One of the best ways to cut down on waste and save money during your move from one home to another is to rent moving boxes for packing household items. Whether you want to live a more eco-friendly lifestyle or you just want more reliable and sturdy containers in which to transport your belongings, you should definitely consider these reusable moving boxes. Luckily, more and more companies are offering these moving bins for rent all over the country! If you’re curious about which company serves your area, look for your state below. Moving from one home to another creates a lot of waste, but you can cut out at least some of that waste with these reusable moving boxes. I’m generally a fan of paper over plastic. If I forget my reusable bags at the grocery store, I will always opt for paper bags over plastic bags. I even advocate for cardboard furniture and home decor! With that said, you would think that I would prefer cardboard boxes over plastic moving boxes. However, that is not the case because of one key reason. With cardboard moving boxes, I can hope to source it second-hand and pass it on to someone once I finish unpacking. However, I only reasonably expect cardboard boxes to have a lifespan of three moves. However, when I rent plastic moving boxes, these same boxes can be used hundreds of times before they’re ultimately recycled. For high wear and tear activities (like transporting heavy, awkwardly shaped household items), reusable plastic moving boxes are definitely the eco-friendly choice. Larger cardboard boxes are simply too large for one person to move on their own. They generally do not have handles or grips, so it’s always a bit awkward to lift. If you didn’t pack items in securely, they can move around and tear the box. If it rains on moving day, you’re in trouble! I could go on and on. But if you’ve used a cardboard box for moving before, I think you’ll understand that there are some problems with them. Luckily, more and more companies are popping up to offer plastic moving boxes for rent. As more and more people express concerned about the sustainability of our everyday choices, we see these new innovative eco-friendly companies popping up in so many states. Moving box rental companies often only operate locally because their inventory is heavy. 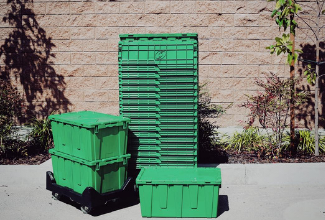 Shipping these green moving boxes would not make financial or environmental sense – they simply wouldn’t be “green” anymore if empty boxes were being shipped back and forth across the country! Most of these companies also offer free delivery (of the boxes, not your stuff!) and moving supplies as part of a moving box set (i.e., with the rental of a “1 bedroom apartment package”). It’s super simple to rent moving boxes if there’s a company offering them for rent in your area. To make it easier for you, I’ve compiled a list of companies by U.S. state (however, in general, they mostly serve larger cities at this time). * If you are a reusable plastic box company and would like me to add your company to this list, please contact me. I would love to spread the word about your service! Local service providers generally require that you rent and return their boxes to the same location, or at least to a location where they have another warehouse. For this reason, if you’re moving from one state to another, U-Haul might be your best bet because they have so many locations nationally. You can check this U-Haul map to see if they service your old and new residence. An alternative to renting moving boxes is simply to purchase your own. However, I DO NOT recommend doing so, with one exception. For smaller items (i.e., to hold some sewing supplies or small winter accessories), these 17L boxes are a nice option for a good price. If you need somewhere to store extra clothes, but you still want it relatively handy (i.e. in the summer, if you like to store away sweaters, but then there are freak chilly days where you want to pull something out without going into basement storage), these fabric bags might be perfect for you. This moisture-proof bag is perfect to store your huge winter duvets during the winter or to store other bulky items like extra pillows or spare blankets. For heavy-duty needs, this weather-tight box is rugged enough for you to store in your outdoor shed and not worry about pests worming their way inside. They’re a bit pricey, but if you need durability and reliability, you often need to pay a higher price. If you are moving to a different country or no company will serve both your old and new residence, you may need to use cardboard boxes. In this case, to be kind to the planet and your wallet, you should consider used cardboard boxes. You can purchase 16 high-quality, sturdy, cardboard boxes (enough for a studio apartment) for as low as $38 here. For a limited time, save an additional $1 off your order (and always free shipping) with the code ‘TREES‘. This is nearly half the price of new cardboard boxes, and they’ve been used a maximum of one time, some not at all! I’ve searched so many places, I don’t think you’ll find a better price than this. The company gets their inventory from large corporations that have either a surplus of boxes, there’s been a misprint so they can’t use the boxes, or the boxes have been used once. They’ve cut down no trees to obtain their inventory because the cardboard boxes they offer are all saved from the recycling facilities or the landfills of other companies. If you want a water-resistant and durable box with which to move your household belongings, renting plastic moving boxes are a no-brainer. If you’re looking to move as sustainably as possible, these are the greenest moving boxes you’ll be able to find. Boxes are very helpful for packing and moving. I am impressed from this post. Your blog gives a lot of information regarding how collect boxes for moving. Thanks for such post and please keep it up. I like the idea, but can you rent it for out of state moves? Very insightful and Interesting! Keep up the blog post! Thanks for crafting this amazing list and including our family owned startup on it. The HiveBoxx Team in Seattle, WA is looking to create more buzz around our services so please let me know if you have any questions as we go beyond the box for a true end-to-end sustainable moving solution.